Guten tag, Bangalore! We’re all really fascinated by Germany. Sausages, sauerkraut, beer, Oktoberfest and Bastian Schweinsteiger are things we all love. So if you want to learn to pronounce Bastian’s name just like he does, here’s our guide to the best German classes in the city. Bangalore’s more recognised German language school, Goethe-Institut offers German courses for beginners and amateurs. They have intensive and super intensive courses, varying by the frequency of classes and the levels of difficulty. Super intensive courses go to levels to familiarise you with the language. They even prep you for German exams and you can even do a course in teaching the language! Courses start at INR 17,500 depending on the level and the type of course. There are even online courses for them busy folks. The Indian Institute of Foreign Languages has classes in Banashankari, Marathahalli and Jayanagar. They have classes either on weekends or weekdays and have an intensive course on all levels of German language speaking. Classes start at INR 11,500 and go on for 75 days if on weekends and 45 days if weekdays. Study materials are all included in the cost. They also teach a host of other languages, including Japanese, French and Spanish. Corporates, Language Translation and Soft Skills Training are all part of it. 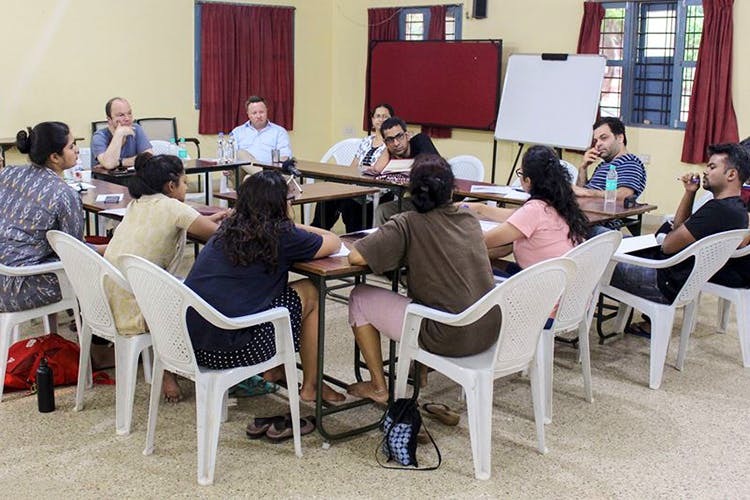 The Deutsch Center in Malleswaram is in partnership with the OSD, Austria and offers German language courses at the A1, A2 and B1 levels, which is the maximum in a proficient course. They also do corporate training in basic German and business etiquette in Germany. The courses for individuals are two months long and start at INR 17,000. Their certificates are recognised by universities in Austria, Switzerland and Germany. The German Language Academy in HSR Layout has German language courses for 3, 4 and 5 months at different levels of difficulty. The courses start at INR 14,000 for 3 months and go upward. The GLA also includes study material in the cost and you get course books and a certificate of completion. They also conduct summer camps and special batches on request. Inlingua Bangalore teaches German in all difficulty levels, over courses of two months, in centres at Jayanagar, Malleswaram and Whitefield. They have classes on weekdays and weekends and you can even learn online. Apart from German, they also have online training classes and virtual training. Corporates also have language training, soft skills, translation and business skills. There’s a lot of languages to learn, including French, Spanish, Italian, Arabic and much more.